Pressed flowers don’t only preserve one of nature’s most beautiful gifts, but they’re also perfect for adorning just about any project, whether it be for use in the home, on accessories, featured on ornaments and so much more. Not only will you learn how to press flowers within the tutorials below, but you can then take those flattened blooms and create amazing things with them, just as the following bloggers have done! It’s time to embrace all things floral by checking out the amazing 40 DIY tutorials below! Here’s a pressed flower jewelry tutorial with a difference! All Things with Purpose has created this stunning pressed flower petal necklace and it serves as the perfect gift for loved ones too. This tutorial via A Practical Wedding will show you how to make your own pressed flower Luminaria – isn’t that amazing? Art Jewelry Elements creates her own spectacular pressed flower beads from clay and in this tutorial she’ll also show you how you can recreate your own! You can use these in all sorts of craft projects. 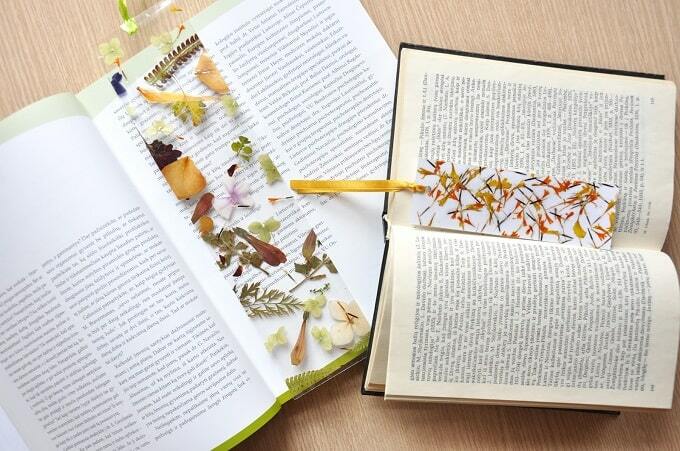 Here’s one of the easiest ways that you can create your own pressed flower bookmarks, thanks to this tutorial from Baby Center. Aren’t they gorgeous? You can use any flowers that your heart desires. 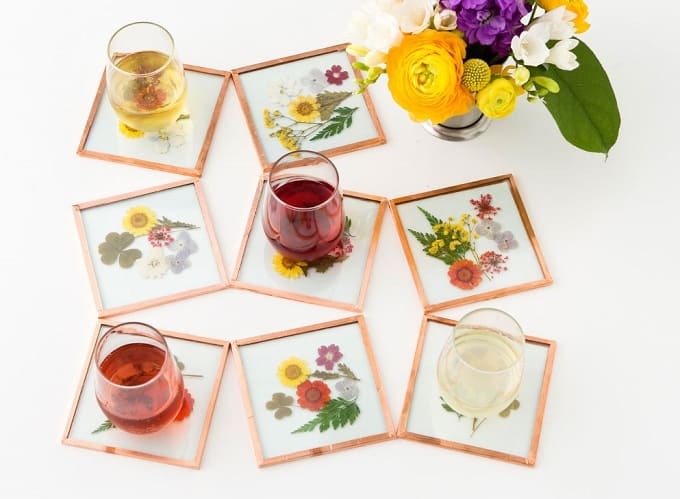 Wow, these DIY pressed flower coasters from Brit + Co are stunning! To make your own, be sure to follow this step-by-step tutorial. With just a clear phone cover, some glue, and an assortment of pressed flowers, you too can make your very own version of this project! Capture by Lucy is here to show you how. Here’s a lovely Easter egg DIY that you won’t want to miss! Clover Home has actually decorated her eggs with pressed flowers for a unique, feminine, and beautiful take on the popular trend. 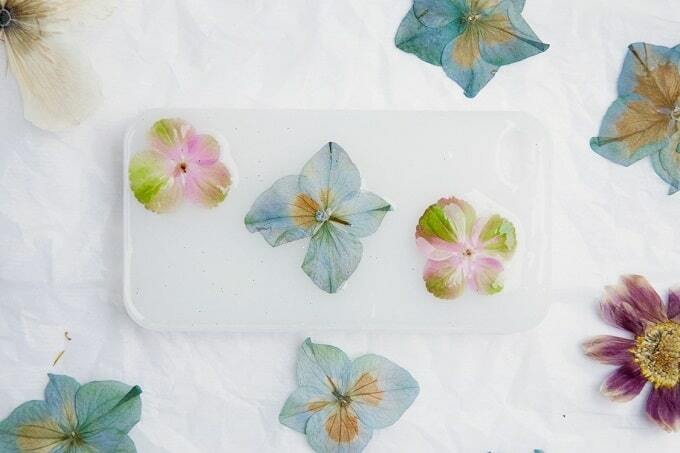 Here’s another DIY pressed flower phone case tutorial, this time with a difference! To make your own version of this artistic phone cover, be sure to check out the Etsy blog. 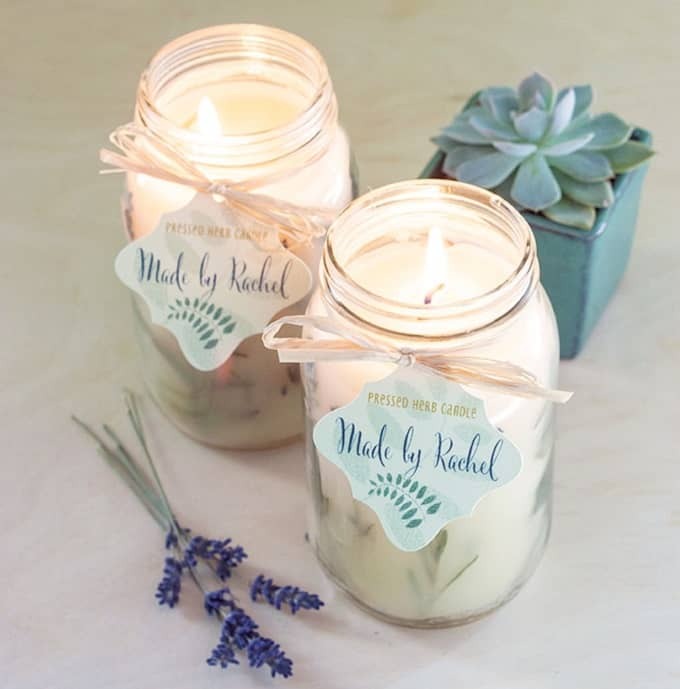 You can even create your own pressed flower candles to adorn your space with and give as gifts to loved ones! Evermine is the talented blogger behind this awesome DIY project. Free People have created a DIY pressed flower clock and we think it’s one of the prettiest things ever! This project is also super easy to create, so be sure to check out the instructional guide. Here’s how you can make a beautiful pressed flower card for Mother’s Day, or for any relevant occasion for that matter! You won’t want to miss this gorgeous tutorial from Free People. Free People have discovered an easy way to make DIY pressed flower art for your walls and they’re here to share this simple tutorial with you all! What a wonderful idea for a gallery wall too. Did you know that you can make paper by hand, plus it can contain pretty pressed flowers? Garden Matter discovered this for herself so created this insightful tutorial! Garden Matter is the genius behind this wonderful tutorial which will help you to create these DIY pressed flower dishes. Don’t they look divine? Garden Therapy will teach you everything you need to know in order to make these DIY pressed leaf and flower rings. These would make the most perfect presents! If you don’t own a flower press, Home Talk will actually show you how you can use your humble microwave to press flowers instead – Genius! This is a quick and modern way to create beautiful pressed flowers. The tutorial for this incredible pressed flower sun catcher is brought to you by the talented In the Playroom. What beautiful flowers will you use? You can even use pressed flowers on your nails – isn’t that amazing? Love Maegan will show you how she transformed her simple nail art into these botanical masterpieces. These DIY pressed flower artworks will instantly transform your walls from blah to beautiful! Lowes is the talented blogger behind this tutorial and you won’t want to miss it. 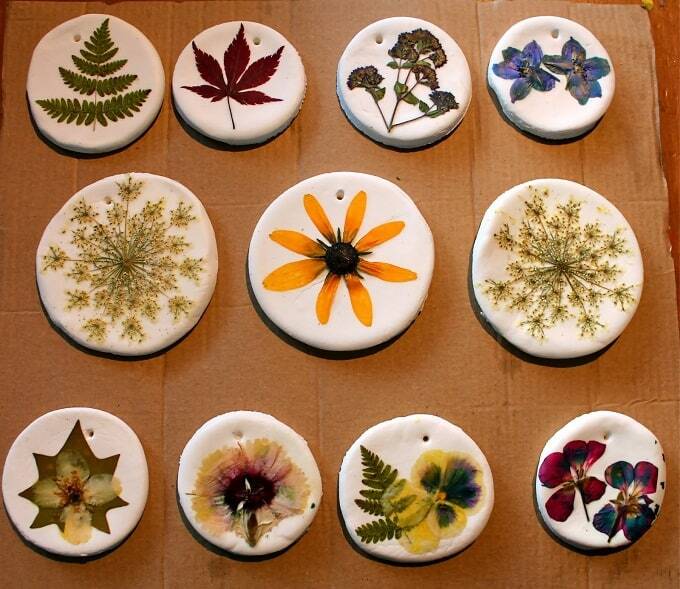 Here are some amazing DIY pressed flower coasters from none other than the talented Martha Stewart! You can create your own floral designs or copy Martha’s for a stylish new addition to your coffee table. Martha Stewart loves pressed flowers so much that she also created these DIY pressed flower cards – Aren’t they gorgeous? Anyone would love receiving a one-of-a-kind card like these. If you’ve never really pressed flowers before and don’t know where to start, then this tutorial via Martha Stewart will show you how it’s done! It’s time to find out everything you need to know to get started with these crafts. Martha Stewart has also created these unique pressed flower plates and they’re perfect for special occasions and dinner parties! What flower varieties will you use? Here’s an assortment of DIY pressed flower and leaf trays that you can use for a variety of uses, whether it be storing jewelry, keys, or even delectable dishes! Minted will show you how. These gold and glass pressed flower ornaments are simply stunning, aren’t they? Monster Circus created these within no time at all, and now you can too! 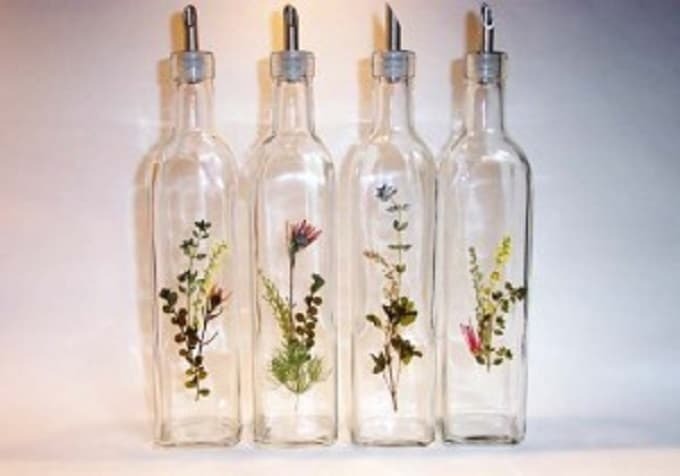 Imagine filling these DIY pressed flower bottles with your favorite beverages. Parent Society has this clever project for you so be sure to check out their full tutorial! 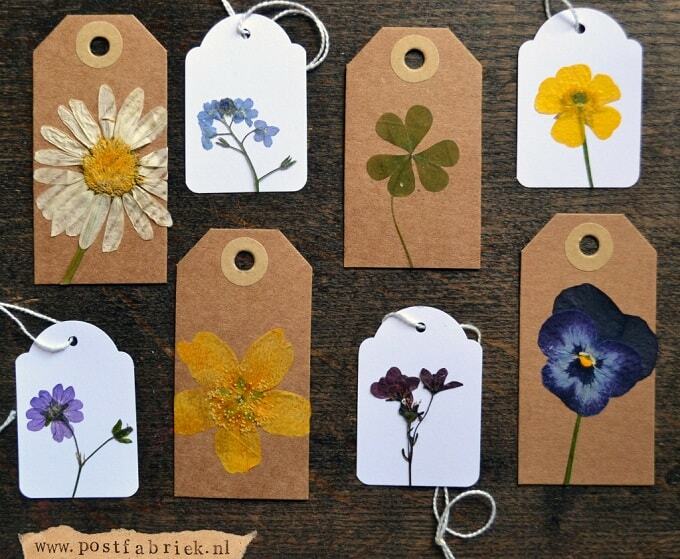 You can also make these gorgeous pressed flower gift tags to adorn your gifts – isn’t that wonderful? Post Fabriek is the talented crafter behind this tutorial and you’ll love her instructional guide. Here’s one way to jazz-up your plain white trays – by decorating them with pressed flowers, just as Say Yes has done! You’d be surprised by how easy this is. Søstrene Grene has taken her pressed flower art one step further and incorporated the real flowers into beautiful illustrations. Check out her YouTube tutorial for the steps! Here’s another amazing DIY pressed flower tutorial teaching you how to make bookmarks, this time from the talented Spalvotas Dryzuotas. Which style do you prefer? You can even transform your key-rings using pressed flowers for an eye-catching and girly style! Sunny Day Today Mama tried this with her own key-ring and look at that wonderful result. These DIY pressed flower tattoos will blow your mind! You can actually create these in little to no time, so be sure to check out the full steps from That Cheap B*tch to find out how. Here’s some more incredible pressed flower coasters, with The Crafted Life using natural wood to really celebrate nature. Make some as a unique gift or even just to jazz-up your dining room. How great is this DIY pressed flower art display from The Merry Thought? It serves as the perfect table centerpiece, or even a pretty addition to your bedside table. Would you like to make your own flower press in order to create all of these wonderful DIY projects? Thankfully, The Merry Thought has discovered how to do just this! This DIY hanging pressed flower ornament mobile might be a bit of a mouthful to say, but it’s certainly a winning craft project in our eyes! Twig and Toadstool loves the end result and we do too. By following the above tutorial from Twig and Toadstool, you can also make these pressed flower ornaments using clay. These are great to hang on your Christmas tree or anywhere else that your heart desires! This vintage-inspired pressed flower art would look great in any country-inspired cottage – don’t you think? The full tutorial can be found via Hi and Hello. Ta-da! Which of these DIY pressed flower projects were your favorite? We’d love to hear from you in the comments section below! Thank you so much for the feature! What a gorgeous roundup!